There's nothing quite like finding an absolute treasure, a reminder of a special holiday or just the right gift for a friend. The Hahndorf Academy Retail Gallery is full of treasures, showcasing South Australian contemporary craft and art. Hahndorf was settled in early 1839 by immigrants from Prussia who came seeking religious freedom and a better life. Their countryside was impoverished and wars frequent. They were granted land in the Adelaide Hills and were soon growing enough produce not only for their own families but to supplement the needs of Adelaide. 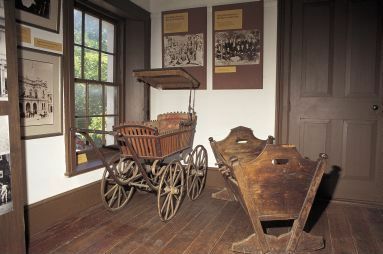 The German migration museum exhibits objects relating to the life of Hahndorf’s pioneering families, including religious and scholastic artefacts. Their religion underpinned their activities and education was a prime focus. Renowned landscape artist Sir Hans Heysen (1877-1968) donated a selection of drawings to the Hahndorf Academy which are now on permanent display. These exquisite sketches and preparatory drawings were completed over a period of fourteen years from 1906 to 1920. They reflect the artist’s love of Hahndorf where he and his wife settled in 1908, as well as his strong support of the Academy. The Hahndorf Academy is proud to be host to a number of established artists who not only work from their studios on the premises but offer classes to the community.